Vizzini: He didn’t fall?! Inconceivable! The usual thrust of this letter is economics, finance, and investing. Lately, however, the political process has been invading my normal domain – sometimes to the dismay of some of my readers. I get that politics comes with the territory; and I think everyone, no matter their political persuasion, will agree that taxes, which are political in nature, have a major impact on economics, finance, and investment. And thus commenting on taxes is fair game. My original intention for this letter was to do an analysis of the Republican tax reform proposals. My associate Patrick Watson and I spent two weeks doing a really deep dive into the proposed reforms. I had the privilege of talking taxes with the chairman of the House Ways and Means Committee, fellow Texan Kevin Brady, as well as his staff. The chairman was kind enough to allow his remarks to be on the record – but his staff made it clear that they were to be on background. We have also talked with numerous think tanks and other experts across the political spectrum. We’ve actually been able to get information on some of the proposed reforms that, as far as we can tell, isn’t available in anything that’s already out there on the Internet. 1. This is a far more sweeping proposed tax reform than Reagan’s. Not even in the same league. When I tell you that it touches everything, I mean that it touches EVERYTHING. And not just in the US. When you begin to think it through, the global implications are truly staggering. If you think you can be in Europe, Asia, or Africa and just be an unaffected observer of these changes, you are not paying attention. They will have profound implications for currency valuations and global trade. Thus what I have for you today is not a one-and-done letter on the proposed tax reform. This is the first part of a series (my guess is that it will run to at least three parts) on the implications of the proposed reform. I keep using the word proposed, as there is a great deal of contention around this legislation. What actually comes out of the sausage-making machine otherwise known as Congress is still hard to predict. But we’re going to explore the key proposals coming out of the Ways and Means Committee, which are what will be debated on the floor. 2. There are parts of this tax proposal that I really like; there are parts I’m okay with; and there are parts that I think have potentially serious negative implications for some people and countries. There will be very clear winners and losers. But as one insider told me, there are always winners and losers in any major tax reform. If we leap ahead seven years, I think we’ll find the overall economic climate much improved by what I am seeing proposed today. It is the transition to that outcome that concerns me. The ride from here to there could get rather bumpy. 3. At the heart of the proposed reform is the very serious objective of creating new jobs. But which jobs, what kind of jobs, and where? At the top of the letter I quoted Montoya from The Princess Bride (come on, you have to admit that you watched it at least once): “I do not think that word means what you think it means.” As we will see today, I am not sure that job creation means what the Republicans think it means. We are going to look at the proposed tax reform on a philosophical level first and then drill down into the nitty-gritty of the actual proposals. As noted above, almost every person that I talked to about tax reform agreed that the first objective must be to create Jobs. I was told of a private conversation between Steve Bannon and Elon Musk. Bannon was laser focused on creating jobs. “How do we get solar jobs in West Virginia?” he demanded of Musk. The entire transition team’s number one objective is creating jobs. Good jobs, American jobs. That was the heart and soul of Trump’s campaign. Even Paul Krugman will tell you that the way to get out of our current malaise is economic growth through job creation. While there are serious disagreements on the path, everybody agrees on the objective. I am not so sure that everyone understands the nature of the terrain we must cross in our quest to create jobs, let alone the changing characteristics of the objective. Let’s start with a story to illustrate my concern. There is a company in the United States that began by offering a few products directly to consumers, and then quickly expanded its offerings until they included almost everything a person could want. This company went directly to the consumer, bypassing local brick-and-mortar stores, and became enormously successful, meeting the needs of its customers all over the country. Of course, the local stores were often (as economists will say) “disintermediated,” which is a fancy way of saying they couldn’t compete on price and selection, let alone delivery and convenience, and went belly up. And with them went the jobs of the people they employed. Recently I’ve been using that story in my speeches and conversations, and everyone nods their heads and says, either out loud or mentally, “Amazon.” Except that I’m not talking about Amazon. I’m talking about another icon of American retailing called Sears, Roebuck & Co. In the late 1800s, Richard Sears began to sell watches by mail order. He sold that company, but a few years later he started another mail order business to sell clothing and other products. The initiation of rural free delivery in 1896 and parcel post in 1913 enabled Sears to send its merchandise to even the most isolated customers. The Sears catalog became a staple of American family life. By the 1960s one out of 200 US workers received a Sears paycheck, and one out of every three carried a Sears credit card. The Sears catalog was a book of dreams that allowed those of us who grew up in rural America to access products that were either not available or were very high-priced in our local general store. It’s hard for the younger generation to understand, but the Sears catalog coming to our mailbox was a big event in my youth. The Montgomery Ward catalog was a close second. The whole family perused those catalogs page by page to mull over what we needed or wanted. I’m sure I was not the only kid who circled a few toys that he hoped Santa would bring him for Christmas. It’s hard to believe, but Sears didn’t really have a physical store until the 1920s, by which time the company was the largest retailer in the world. But Sears’ experience enabled Sam Walton, who didn’t start until 1962, to surpass Sears by 1990; and by 2000 Walmart’s sales were six times those of Sears. Fast-forward to 2017. The 178,000 current employees of Sears are an endangered species. Sears had 3555 stores in 2010, and today it has 1503 and will close another 10% of those this year. Additional stores will be closed sooner rather than later. Unless hedge fund genius Eddie Lampert can pull yet another rabbit out of his seemingly bottomless hat, Sears will pass the way of Blockbuster and Kodak. Remember Blockbuster? Founded in 1985, at its peak in 2004 Blockbuster had 60,000 employees and 8,000 stores. By 2010 it was bankrupt. There are only about 50 Blockbuster franchise stores still left. But what do these sober tales have to do with tax reform? Tax reform, at least the Republican version, is predicated on creating jobs in the United States. In his campaign and since, Trump has focused on how Americans are losing jobs to foreign competitors. A seemingly straightforward trend, right? Jobs leave here and go to China and Mexico. The truth is a little more complex. 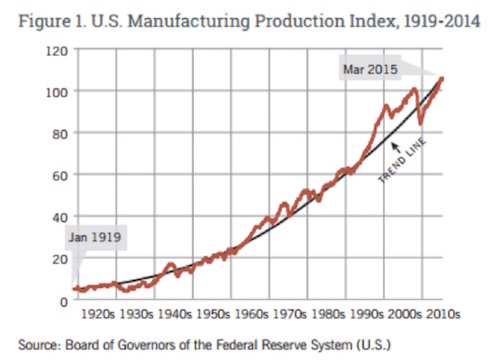 The simple fact of the matter is that United States is producing more manufactured goods than ever before. And the growth trend in manufacturing, which was established in the 1920s, has shown no signs of slackening, even through recessions. The chart below is from a study done by two professors at Ball State University. It’s a fabulous analysis that shows that 80% of the jobs that have been lost in American manufacturing have been lost due to technology. American workers are now dramatically more productive than they were in just the year 2000. The authors point out that our 12 million manufacturing jobs today produce the same amount of goods as 21 million manufacturing jobs did in 2000. That trend is not going to change. Technology is going to continue to increase the productivity of American (and global!) manufacturing. With companies like Foxconn in China creating robotic production lines, the cost of labor is truly becoming a rounding error in manufacturing. Prediction: Apple will soon be manufacturing the iPhone 9 or 10 in the United States. But producing those iPhones here won’t create that many jobs, because the work will be done on a robotic assembly line. If the border adjustability tax, which is part of the proposed tax reform happens, Apple will onshore that production even faster. Why? Because the most tax-advantaged country in which to produce products will be the US. True, other countries might offer zero tax as well, but they don’t have the infrastructure and available talent that the US does. The current tax proposal would make Reagan proud. And the expectations of everyone I am talking to are that the planned tax reforms will have the same effects that reforms did in the ’80s and ’90s. Problem is, now it’s 2017. I am worried that the future won’t see us losing manufacturing jobs so much as service jobs. Losing 178,000 Sears workers is a big deal. But Amazon is slowly putting small businesses out of work, too: we’re losing 5 jobs here and 10 jobs there. Some of the biggest mall owners in the world (according to a Wall Street Journal cover story) are simply turning the keys over to the bondholders who financed the mall mortgages. They can no longer make money on their properties. If Sears closes down, that takes the anchor store out of hundreds of malls, making them less viable. Stores in the mall that depend on Sears building the traffic go away as well. If you are in the market for a diamond, do you go to the mall to look in jewelry stores? Not if you’re a smart shopper. You might go to the mall to see what you like, but you buy at Blue Nile, which is a kind of eBay for diamonds and other jewelry. Personal story: Some of my friends know that I am now actually engaged, so I was in the market for a nice diamond. I called two friends who turn up their noses at having to pay retail or even wholesale. I wanted to buy my diamond wherever they would go. They both said that the diamond market has completely changed. Go to Blue Nile, they said; you can get practically anything you can imagine, and it gets delivered quickly. Diamonds are typically sold at about a 3% margin, but that is not a margin that mall jewelry stores can survive on. Amazon and Walmart did just fine last Christmas. Many other retailers, not so much. Online sales grew by 14% last holiday season, the fastest growth in five years. In-store sales grew by only 1.4%, not even keeping up with inflation. And that trend is going to continue. Amazon and its online cohorts are clearly the wave of the future. One of the last great catalog companies, U-Line, sends their catalog out as a spur to online purchasing, not so much as an alternative method. I have recently been in one of their million-square-foot warehouses, and they were literally shipping orders the same day. As longtime readers know, I’m writing a book about what the next 20 years will look like. And as I’ve mentioned before, the most difficult chapter is on the future of work. In the coming weeks, we are going to see that the proposed tax reform is going to turn the finance world on its head. That world – what we think of as traditional banking and investment –puts only about 15% of its investment money into new-business development. The rest goes to financialization and the buying and selling of existing companies (share buybacks, etc.). In the proposed tax reform, 100% of investments will be allowed to be written off in the first year. Build a factory? Forget amortization: write it all off this year. Everything but the land will be a 100% write-off. Not only will that policy create construction jobs; it will create jobs for people who make the equipment that goes into the production lines, as well as jobs for people who work in those plants. The current tax proposal works well for traditional businesses. And it will certainly kindle whatever animal spirits are out there in nascent form. Upon reflection, I am not sure that you could create more retail and service jobs with any other tax reform than what is proposed, but that reform may not be enough. As more and more retail jobs succumb to online sales, robots, artificial intelligence, and other technologies, it may be increasingly difficult to counter the losses with new job gains. Not this year or next year but sometime in the future we are going to have to consider what we as a society are going to do in a post-employment world. By that I don’t mean that work will disappear, but there will be ever fewer jobs for workers who are “down the food chain.” Between 2022 and 2030 we are going to see the loss of roughly 3 million truck and taxi driver jobs. Where will those people find other work? And that is just one industry. What happens when we have a silver bullet for cancer? Which we will, hopefully sooner rather than later. All those hospitals, all those healthcare workers, all those pharmaceutical companies that depend on a steady supply of cancer patients will be out of work. And we are talking hundreds and hundreds of thousands of workers, who are generally highly paid. What happens when we beat Alzheimer’s? Or any one of another dozen diseases that are terribly debilitating and that cost enormous amounts of money to take care of and require the services of hundreds of thousands of caregivers. I’m going to stop here and pick up our discussion next week. But I’m going to leave you in the capable hands of my good friend Charles Gave, who will talk about yet another problem that could become a global issue because of the border adjustment tax (BAT). Rather than restate his brilliantly outlined concerns, I’ll share them with you in their original form. (I thank my friends at GaveKal for letting me use Charles’s work so freely.) At the end he offers what he calls a modest proposal to save the world. In one of the upcoming parts of this series I will offer my own version. And make no mistake, we are talking about saving the world. When I say this tax proposal touches everything, I mean everything. Next week we will look at other problems surrounding the BAT. I get the concept and even agree with the basic proposition, but the proposal comes with some serious potential unintended consequences. For now, though, let’s consider what has Charles worried: the end of the US dollar’s reign as the world’s reserve currency. I find myself in the strange situation of cheering Donald Trump’s nascent program of economic renewal for the US, while worrying deeply about the domino effect that may topple a dollar-based global financial system whose health has relied greatly on benign neglect by the United States. The good news is that since the fall of the Berlin Wall I have never seen a president or prime minister of the right come into power with an agenda that so squarely opposes the doxa of left-leaning elitist circles. Whether in education, regulation, taxes, ecology, energy production, culture, justice, military strategy or national security, most of the president-elect’s cabinet nominees have for decades fought a flabby intellectual orthodoxy. Yet, while I welcome Trump’s attack on a credo which has done much to enfeeble the Western world, I am not blind to the violent economic and financial dislocation which may mark the transition from one reserve currency order to another. At the end of this paper, I offer a modest suggestion for avoiding a scenario which has the potential to morph into a 1930s-style beggar-thy-neighbor episode on steroids. The starting point is that the US dollar has been the world’s reserve currency since the end of World War II, with 1971 marking the transition to a pure fiat regime. Markets, institutions and investor habits have developed according to this basic building block. Yet there is nothing immutable or inevitable about the US sponsoring such a currency arrangement. Indeed, Trump’s core economic platform of trade protection points to the US pursuing an objective which is guaranteed to kill the existence of the US dollar as the sole reserve currency – namely the US’s apparent pursuit of a current account surplus. To explain my point, I will use Jacques Rueff’s powerful framework for thinking about the US dollar’s international relationships, namely the “double pyramid of credit”. Rueff was an economist and senior civil servant who between 1923 and 1969 was France’s chief negotiator at international monetary conferences, and a sophisticated observer of the international payments system. Rather like his archrival John Maynard Keynes, Rueff was both a theoretician and a practical man of action who was involved in actually building the global financial system. One of his key ideas was that in the post-gold standard era, a side effect of one country controlling the reserve currency would be an end to the zero sum game of credit expansion associated with an independent specie-based system. Instead, Rueff’s double pyramid of credit idea described a new order that would likely be characterized by inflation, over indebtedness, capital misallocation, and episodic financial crises. By way of a simplified example, consider a Rueffian take on the relationship between the US and Japan under the post-1971 US dollar reserve system. Say the US went through a big credit expansion, causing it to run a large current account deficit with its East Asian trade partner. The corresponding current account surplus in Japan would spur creation of new Japanese bank deposits, and with them a credit expansion. Under the gold exchange standard, such credits in Japan would have been offset by reduced money supply in the US due to the physical transfer of gold from the US to Japan by way of deficit settlement. As a result, the global system of payments was a zero sum affair; and credit expansion did not, on balance, change over time. This was upended in 1971 when the US stopped settling its current account deficit in gold (Charles de Gaulle, on Rueff’s advice, catalyzed this shift by demanding that the US settle with a physical transfer of gold ingots). Subsequently, US dollars earned by Japanese firms have not been exchanged against gold, but rather “redeposited” at the Federal Reserve via a process of foreign exchange reserve accumulation. As a result, the US has not faced higher interest rates from its deficit with Japan and by extension from its habitual global current account déficit. It was this ability for credit to keep growing in both the US and its creditor nations that led Rueff to coin his double pyramid moniker. In the above example, both Japan and the US were able to sustain credit growth, although the ultimate source for both was “excess” US money supply. This money creation machine has only properly broken down during periods of high US inflation which have necessitated sustained tightening by the Federal Reserve. Experience has shown that the US central bank has kept obsessively focused on consumer price inflation and disregarded events in asset markets, even if stocks were surging, the dollar exchange rate was plunging and property prices were going stratospheric. The Fed has proven willfully blind to effects from the double pyramid of credit by responding only to US price and growth data. In short, it may be the world’s central banker, but the Fed has resolutely only followed US rules. The problem with this double expansion of credit is that it tends to compound economic divergence, rather than convergence, which for all its faults was the logic of the old gold exchange standard. Consider the experience of Japan and the US over the last 30 years. The former proved unable to manage twin objectives of limiting yen appreciation and keeping control of its money supply. The upshot was a huge asset bubble in the late 1980s, which turned into a bust from which Japan has never fully recovered. Fast forward to the early 2000s when two new beneficiaries of this double pyramid of credit started to take off. One was China and the other, what we have called “platform” companies, or firms which outsource much of their production and working capital needs to dispersed supply chains in places such as East Asia, Eastern Europe and Mexico. The rational actions of these two “actors” following Rueff’s double-pyramid-of-credit logic has resulted in violent asset price cycles – Chinese financial repression led to surging property prices, oil experienced an epic boom-bust cycle and US equities have been pumped up on the promise of permanently cheap money. The flip side has been acute deindustrialization in the US as firms have shifted production to China and other low cost production centers. Put simply, the double pyramid of credit phenomenon hugely exacerbated the hollowing out of the US industrial sector, and so is the proximate cause of Trump’s rise to power. Indeed, it is ironic that US automobile firms are making cars in Mexico for sale to US buyers who can’t – by any normal measure – afford to buy them, as they don’t have a proper job. Luckily US auto firms have organized credit lines for their buyers, even though it is obvious that much of this debt will never be repaid. As with the US-Japan relationship, the US automobile ecosystem has been on a trajectory of divergence rather than convergence. The double increase in leverage (both in Mexico and through vendor financing offered by US auto finance firms) has replaced demand that comes from an organic rise in US living standards. The logical end result would be for car production in the US to be eliminated, and displaced “workers” given government handouts so they can buy Mexican-made vehicles from firms that can declare splendid earnings guaranteed by Uncle Sam. I exaggerate for effect, but this example shows that the US’s “exorbitant privilege” has little to do with free market principles as it means the US (i) lacks a foreign trade constraint, and (ii) can force other countries to accept payment in dollars. Should either of these conditions end then the credit pyramid would implode. And indeed for decades commentators have fretted that the rest of the world may one day lose confidence in the US dollar as a store of value, resulting in soaring US interest rates and an economic crash – the Japanese, Chinese and a Brazilian supermodel have, at different times, all been touted as potential liquidators. I never believed such scare stories so long as the US remained a superpower capable of corralling international respect. What worried me was a situation where the US, for domestic political reasons, pulled up the drawbridge and chose to pursue a current account surplus. Such an outcome was always going to be driven by Americans at large concluding that the global production system was being run against their interests. This was the backdrop for the emergence of “Trumponomics” and the fact that the US apparently wants to challenge China and Germany to become a surplus economy. To this end, US policymakers hope to tax imports at 20% and subsidize exports by a similar amount (i.e. what many export-focused economies do through VAT systems). Returning to Rueff’s monetary construct, Trump may just as well have said that he wanted to destroy the double pyramid of credit, which has grown relentlessly outside of the US since the mid-1960s. Whatever the rights and wrongs of the global economic status quo, dismantling such a huge pyramid of credit threatens havoc for the financial system. Should the US return to a current account surplus, the rest of the world will move to an aggregated current account deficit. Since all other countries have a trade constraint, the system will inevitably start to contract, led by those nations already running a current account deficit. Such economies will have to tighten policy almost immediately, resulting in a big decline in domestic demand and so reduced imports. The consequence will be that even “surplus” economies will move into a current account deficit and be forced into a tightening cycle. Those with an eye for history will have recognized a pattern as this chain of events was roughly what happened in the 1930s when another big pyramid of external credit collapsed – in this period, Britain was unable to regain its primacy at the center of the old gold standard system and the US was not willing to assume an economic leadership role. When the US sought a reflationary devaluation of the dollar in 1934 by constraining the sale of gold, it did so despite running a current account surplus. That decision aided the US’s economic recovery, but helped tip the German and French economies into a depression, ensuring the onset of World War II. Fast forward to today and in some ways the ambition of US policymakers exceeds that of the 1930s. In addition to trade protection measures, Trump wants to ensure that dollars held outside of the US, especially those controlled by US multinationals, are sent back home. On the basis that history rhymes rather than being repeated, it is worth recalling that in the 1930s US banks aggressively recalled German loans, leading to the collapse of the German banking system. It is worth remembering that seemingly fixed elements of the global credit system developed in a haphazard fashion and can easily be reversed. For example, the Eurodollar market evolved after 1963 when John F Kennedy acted to reduce a growing US balance of payments deficit by taxing US investors who took dollars abroad to buy foreign securities. Subsequently, US dollars held outside of the US were mostly taxed at a lower rate than onshore dollars, and it was this “arbitrage” that allowed the City of London to develop and the external pyramid of credit to grow. If the tax system which encouraged US dollars to stay outside of the US disappears, then the US$1.2trn or so owned by US multinationals – the backbone of international credit markets – may be about to move back onshore. For the City of London, where most external dollars are managed day to day, the blowback could end up being far more serious than the loss of European Union passporting ri ghts due to Brexit. As a result, the future of international capital flows looks pretty gloomy. Indeed, on a flow basis the US dollar may increasingly become a collector’s item. This matters because many countries rely on US dollars being readily available to plug balance of payment deficits – according to a Bank of International Settlements report from 2015 the preceding decade saw non-US entities borrow some US$10trn. Since the US can seemingly no longer be relied on to play the global shock absorber by expanding its current account deficit, the key headache for emerging economies may become servicing their stock of US dollar debt. So long as US short rates stayed low and the dollar exchange rate did not appreciate unduly (i.e. the situation since 2008), this was a manageable task. Yet in the event of the US current account starting to improve markedly (or even going into surplus), borrowers will find it impossible to repay principal as the US currency will have effectively been cornered, and there will not be enough dollars available to satisfy demand. This situation will be exacerbated if the borrowed dollars were used to build factories whose output is sold in the US. The threatened imposition of a 20% surcharge on foreign-made imports to the US will render such factories unprofitable, but the debt will still have to be repaid. In short, the external part of the double pyramid of credit could involve subprime-type write-offs, only much larger. • The US should adopt market-friendly policies that boost the economy’s structural growth rate as is clearly the case with the program being put forward by Trump and the House Republicans. • More difficult, but far more important than the first goal, Trump needs to pursue policies for which he was not elected; namely to prevent a collapse in the growth rate outside of the US. The transmission mechanism for a bad cycle to unfold will be a far stronger US dollar; the inevitable result of ROIC in the US rising sharply. Such a situation will quickly hurt those fellows detailed above with heavy dollar debts as they never expected the US to actively reduce ROIC in the rest of the world. Should an acute dollar squeeze develop of a type last seen in the early 1980s then the exchange rate will soar, and ultimately the US will suffer due to US firms experiencing a sharply lower return on invested capital. For their part, US lenders will face huge defaults by stressed foreign borrowers. To avoid such a scenario, the US should stand ready to buy, outright, the currencies of those countries facing payment difficulties. This will leave the US with huge foreign exchange reserves and the rest of the world with enough dollars to service their debts and meet payment obligations. As such, an implosion of the foreign pyramid of credit need not mean a collapse in the non-US money supply. Put another way, the US authorities should stand ready to build reserves in foreign currencies equivalent to the sum that vanishes through the credit contraction it has engendered. The new US administration should thus launch a strategic fund ready to buy any foreign currency each time it becomes two standard deviations undervalued as measured by the OECD. Funding should come from the Federal Reserve at a market rate of interest and a stipulation should be made that the program is wound up as soon as the “new” foreign exchange reserves reach a level equal to about six months of US imports. The profits that will almost certainly accrue from such a program should be used directly to offset budget deficits that Trump’s fiscal expansion is likely to deliver. On Wednesday, I will be leaving to speak at the Orlando Money Show February 8–11 at the Omni in Orlando. It turns out my friend Larry Kudlow will be speaking that afternoon, and in theory we are going to have dinner with each other. There will be lots to talk about, that’s for sure. Registration for the conference is free. I am also scheduled to speak at a large alternative investment conference called CAIS in the Cayman Islands, February 14 to 18. Like much of the country last night, I watched the Super Bowl. My apartment is particularly well set up to have larger parties, and so I occasionally throw one for friends in the area. One friend pointed out that my last three parties have kind of fit into the theme of unexpected events: a Brexit party, a Trump presidential election night party, and last night’s hard-to-believe comeback victory by the New England Patriots. While I feel sorry for Atlanta Falcons fans, that come-from-behind victory was pretty inspirational. Tom Brady at 39 years old? Really? Just thinking about it makes me want to do a few extra reps in the gym. And eat healthier. I appreciate Lady Gaga’s not doing anything political at the Super Bowl. The Super Bowl should be an event when the country comes together. We have all too few of those these days. I’m a little frustrated in that I would like to just do the whole tax issue in one letter, but then it would probably be 40 pages long, and not many would read it. And writing 40 pages does take some time, even for me. Writing about different aspects of the proposed tax reform will seem somewhat disjointed, so I will probably have to formulate some summary conclusions. There is a lot to like in the proposed tax reform. I understand the theoretical reasons for wanting a border adjustment tax, but my concern is that such a reform doesn’t happen in isolation. The unintended consequences that Charles wrote about can be overcome by doing things that haven’t historically been done by the United States, but for starters there needs to be a clear understanding with a great deal of transparency about what the United States will do if the dollar starts to appreciate significantly. And with that, I think it’s time to hit the send button. Have yourself a great week! INVESTORS are learning to let go of Daddy’s hand. Monetary policy has been very supportive of asset markets over the past eight years but the direction of policy is tilting slowly. The Federal Reserve has increased rates twice already and is expected to push through another three increases this year. The Bank of England has indicated that the next move in rates could be up or down, but that the former looks more likely, especially as inflation is on the rise. The European Central Bank is scheduled to reduce the amount of bond purchases it makes after the end of March. Only the Bank of Japan seems committed to keeping the monetary taps on “full”. The market impact is already visible. 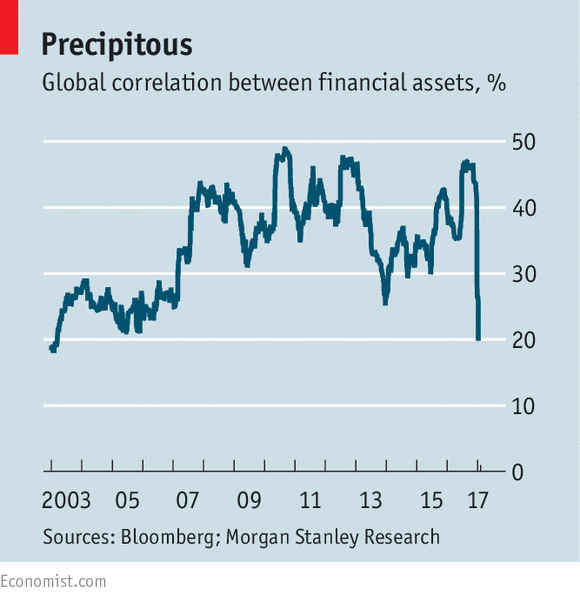 Morgan Stanley says there has been a “crash” in the tendency for assets to correlate with each other in recent months (see chart). Its measure incorporates correlations between different markets (equities and corporate bonds, for example), and between different regions. The recent fall in correlations takes the measure back to where it was in the run-up to the 2007-08 financial crisis. During and after the crisis, correlations rose sharply. First, many investors sold out of risky assets because of the collapse in the financial system. Then, as central banks started to buy bonds through several rounds of quantitative easing (QE), most financial assets rose in tandem. Now that central banks are no longer quite so supportive, it may be time for markets to go their separate ways. The actions of central banks swamped the economic fundamentals; those factors can now reassert themselves. In the first few weeks after Donald Trump’s victory in the presidential election, the value of global shares rose by $3trn and that of bonds fell by the same amount, according to Torsten Slok of Deutsche Bank. The Dow Jones Industrial Average passed 20,000 for the first time on January 25th. Emerging markets have underperformed American shares since Mr Trump’s victory. The rationale behind such differences is that tax cuts in America will improve economic growth (good for equities) but widen the budget deficit and push up inflation (bad for bonds). Mr Trump’s threats of tariffs and border taxes will be good for domestically focused American companies, less so for businesses operating in developing countries. The tricky question is how long these divergences can last without prompting a reaction. At some point, higher bond yields, by raising the cost of borrowing, can crimp economic growth and thus be bad for equities. Bad news for emerging markets can rebound on the developed world. Some of these tensions may play out in the currency markets. They too changed after the 2007-08 crisis. Before the crash, the markets were driven by the “carry trade”, with investors tending to borrow in currencies with very low rates and invest the proceeds in countries with higher rates, pocketing the difference, or carry. Once rates fell towards zero across the developed world, there was less carry to exploit. But monetary policy still played a big role; announcements of QE programmes were seen as a sell signal. For a while, it seemed that most central banks were trying, implicitly or explicitly, to drive their currencies lower. Now there may be some carry to exploit again. The gap between ten-year Treasury-bond yields and German bond yields has widened to more than two percentage points. America was the first leading economy to scale back QE and the first to start raising rates; as a result, the trade-weighted dollar has risen by nearly 35% since August 2011. A stronger greenback creates its own feedback loops. It causes problems for companies in emerging markets that have borrowed in the currency. And, over time, a stronger dollar makes American exporters less competitive and developing-country exporters more so. That thought has already led President Trump to describe the dollar as “too strong”—a remark that, along with his early actions on trade, has prompted the currency to drop back a bit. However, what the president says about the dollar does not really matter. It is the Fed that makes the big decisions that drive the currency. That might change. Mr Trump may bridle at his lack of control over dollar movements. He could try to bully Janet Yellen, the Fed’s chairwoman—as Richard Nixon dominated an earlier chairman, Arthur Burns. Or he might replace her with someone more pliable. The end of central-bank independence really would create a new and unwelcome environment for investors. As everyone already knows, the Fed has finally hiked its interest rates for the second time in a decade and for the first time since December 2015, when it ended the zero interest rate policy. The chart below shows the current level of the effective federal funds rate after the recent move. Chart 1: The effective federal funds rate after the second Fed hike in a decade. What does the Fed hike mean for the U.S. economy? Theoretically, it could be negative for households and companies as higher interest rates imply higher borrowing costs. However, this quarter-point increase was widely expected, hence it was already priced in. Actually, the market-determined long-term real interest rates have increased about 40 basis points in the aftermath of the U.S. presidential elections. Hence, the Fed is already behind the curve. Hence, it is not so simple that higher interest rates threaten growth. It seems that the opposite is true right now: interest rates are higher since growth expectations are stronger. Indeed, markets seem to be comfortable with the Fed's move, as credit spreads are still relatively low. There is agreement that the economic outlook has improved, which justifies higher interest rates. In other words, the Fed's tightening is considered as a vote of confidence in the economy and as a sign of policy normalization after the unprecedented measures implemented after the financial crisis. This is not good news for the gold market, as the hike may strengthen the confidence in the U.S. economy and its currency, which is gold's biggest rival. However, the Fed raise had been already factored into the price of gold. The upward revision of the FOMC members' projection for the federal funds rate from two to three hikes in 2017 was much more important for the bullion market. Consequently, investors' expectations of the Fed's pace of tightening also increased. For example, the market odds of at least one hike by June rose from 62.9 percent to 78.5 percent. Markets generally believed the Fed and are expecting two hikes with higher probability than 50 percent - in June and in September - and put more than 40 percent odds of the third hike in the last month of 2017 (as of December 21, 2016). The steeper path of interest rates is bearish for the gold market. Now, the key question is whether the Fed will deliver these three hikes. We all know about its poor track record and remember how it chickened out again and again last year. Therefore, there are some good reasons to expect that the Fed's stance will soften over the year, which would be positive for gold, which shines under a dovish rather than a hawkish central bank. This was exactly the case of 2016, when the yellow metal flourished when the Fed turned out more dovish than expected and struggled when the U.S. central bank adopted a more hawkish stance. Actually, gold started its bull market (or its upward correction as others would say) just after the December Fed meeting. However, history does not have to repeat itself. 2017 will be different year than 2016 in four important aspects, all of them bearish for gold. First, the uncertainty about the Brexit and the U.S. presidential elections is behind us. Surely, the world remains a fragile place in the inhospitable, dark universe, but geopolitical risks upcoming in 2017, such as elections in Germany or France, may only further strengthen the U.S. dollar. The second important difference is that Donald Trump won the presidential election. Like it or not, his victory changed the market sentiment. Now, investors expect higher inflation, higher interest rates, and faster economic growth. These expectations may be built on sand, but it does not change a situation where the current sentiment towards gold is negative, although it may change later in 2017. Third, technical situation in the gold market is different. In December 2015, gold turned out to have been oversold, while in 2016 it has rallied about 30 percent in the first half of the year. Therefore, although gold plunged in November 2016, it was not oversold before the Fed's move in December. Fourth, the macroeconomic outlook also looks different. Last year, stock market and oil prices both crashed, and people were afraid of the slowdown in the global economy. But at the end of 2016 both oil prices and the stock market rallied, as people are optimistic about the economy. Moreover, the labor market strengthened, while the inflation rate rose, as the chart below shows. Chart 2: The Personal Consumption Expenditures Price Index (red line) and the Consumer Price Index (green line) from 2012 to 2016. Given all these shifts, the Fed's stance also has changed. The recent Yellen remarks suggest that she is no longer willing to accept an overheating for a while. Hence, it seems that the U.S. central bank intends to neutralize possible expansionary fiscal policy with tighter monetary policy. Therefore, the Fed may indeed deliver three hikes or even try to raise interest rates more times this year, as it under-delivered in 2016. We are skeptical about this scenario, but this is what markets seem to believe right now. The key takeaway is that the Fed has finally delivered the second rate hike in a decade. The move was widely expected, but the U.S. central bank surprised markets by revising up the projections for the federal funds rate in 2017. 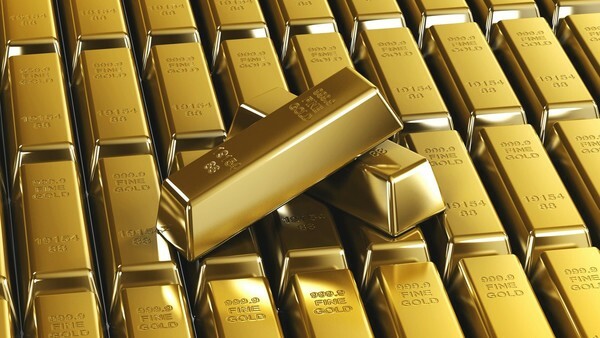 The more hawkish Fed, combined with a slightly improved macroeconomic environment, the eased geopolitical uncertainty and more optimistic market sentiment are negative factors for the gold market. This is why investors should not expect a replay of 2016 when the gold started its rally after the FOMC meeting. We cannot preclude such a scenario, but given the widened divergence between the Fed and other major central banks such as the ECB and the BoJ, we rather expect appreciation of the U.S. dollar, which would exert downward pressure on the yellow metal. What economists and populists both get wrong about the international economy. Economists like to claim that the purpose of free trade is to eliminate barriers that impair the efficient global allocation of resources, while helping some of the world’s poorest people. It’s an argument undermined by a simple thought experiment. Suppose we wiped the slate clean of the Trans-Pacific Partnership, the Transatlantic Trade and Investment Partnership, and other similar trade deals, and the world’s trade negotiators banged their heads to figure out the best way of achieving their stated goals. What would they be negotiating about? Tariffs? Rules on intellectual property rights? Investment regulations? None of the above. They would go instead after barriers to international labor mobility and try to hammer out a deal over some kind of temporary work visa plan, along the lines I describe in an academic paper I recently published. There is practically nothing that would do more to enlarge the economic pie (nationally and globally) while improving the global distribution of income. Of course, anything like that would be wildly unrealistic in the current political climate. But I bring up the thought experiment to illustrate that trade negotiations are only loosely about what they purport to be about: enhancing economic efficiency and economic opportunities. The problem with the present trade regime is not that it sacrifices the political and the social for the economic; it is that it has never made much sense from the economic perspective, either. Which is why it’s a mistake to judge real-word trade agreements strictly on economic terms, rather than social or political ones. In some sense we all know this. Consider another thought experiment: Suppose Harry and John own two companies that compete with each other. How do you feel about each of the following four cases? Harry works really hard, saves and invests a lot, comes up with new techniques, and outcompetes John, resulting in John and his employees losing their jobs. Harry gets a competitive edge over John by finding a cheaper supplier in Germany. Harry drives John out of business by outsourcing to a supplier in Bangladesh, which employs workers in 12-hour shifts and under extremely hazardous conditions. Harry “imports” Bangladeshi workers under temporary contracts and puts them to work under conditions that violate domestic labor, environmental, and safety laws. But most people react very differently to these scenarios. The manner in which the gains and losses are generated matter to them. In particular, scenarios 3 and 4 appear problematic insofar as they produce competition that violates ground rules that have been set at home. Furthermore, scenario 4 would be clearly illegal, but no different in its practical consequences from scenario 3. This raises the question of why we should be OK with scenario 3, while most observers would regard 4 as unconscionable. The point of this second thought experiment is to suggest that certain kinds of international competition can undermine domestic norms with regards to what’s an acceptable redistribution. A similar thing happens when competition from tax havens undermines a domestic tax regime, or when imports from jurisdictions with poor safety enforcement undermine domestic consumer safety rules. It’s important to distinguish between two versions of an argument as to why trade may be problematic from a social or political perspective. Some suggest trade is problematic because it redistributes income. The basis for that claim is true, but trivial. Pretty much everything else that happens in a market economy somehow redistributes income. Technology and market competition are the sources of endless churns in an economy. Moreover, plenty of other things, including skill-biased innovation and minimum-wage laws, have vastly greater effects on income distribution than trade. So it makes very little sense to set international trade apart and decouple it from other domains or approaches for dealing with inequality in labor markets at large (progressive tax systems, active labor market policies, employment-friendly macro policies, etc.). Imports from Germany may adversely affect domestic companies that are displaced, but there’s no reason to treat the people who lose out any differently from workers who are adversely affected by, say, technological innovation. There is a coherent justification for compensating the losers of free trade for reasons of solidarity and equity, but the justification would apply in the case of innovation. Consequently, the preferred remedies should be the same as well. That brings us to a different social and political objection to trade — that trade violates norms embodied in our institutional arrangements. The suggestion here is that trade may undercut the social bargains struck within a nation and embedded in its laws and regulations. This argument corresponds to scenario 3 in the thought experiment above. In that case, compensating the losers would be beside the point, because what is at stake is the surreptitious modification of the rules of the game — the undermining of domestic social bargains through the back door. Trade is not merely a market relationship, but an intervention into domestic institutions and an instrument for reconfiguring them to the detriment of certain groups. It would be entirely legitimate to respond to such an injury by directly curtailing the trade flows that have the alleged effect. After all, this is no different from keeping out imports that violate, say, domestic health and safety regulations, which most countries already do. And this brings us to “fair trade.” Fair trade is much derided by economists who view it as a thinly disguised cover for self-interested protectionism. But it is already enshrined in trade laws (in the form of anti-dumping and safeguard remedies), although in a very skewed, corporation-friendly way. The benefit of thinking about fair trade along these lines is that it allows the drawing of a clear line between trade flows that threaten legitimate domestic political arrangements and those that don’t. For example, there is a clear distinction between situations where a trade partner’s low wages are due to low productivity, and the abuse of worker rights (including, say, the absence of collective bargaining, or freedom of association). Both may generate distributional implications at home, but there is a problem of unfair trade only in the second case. Economists should be more willing to accept that trade may fail to pass the fairness or legitimacy test in certain circumstances. Paradoxically, this would strengthen their defense of international trade in the bulk of cases where the test is easily passed. It would enable them to speak to popular concerns about fairness in trade without undermining the general case for trade. By refusing to acknowledge the possibility of social dumping — and failing to put in place remedies for it — the trade technocracy has opened the door to populists and demagogues on trade. It has allowed trade in general to come under attack instead of the specific problematic flows that probably constitute a very small share of imports. It is a clear instance of trade purists damaging their cause. Some regional trade agreements take social dumping concerns on board, but trying to “improve” other countries’ labor, environmental, or social standards through trade agreements is generally ineffective — and also misguided to the extent that it puts commercial interests in the driver’s seat of what is a deeper developmental problem. There is an important difference, often eluded in fair trade discussions, between using trade policy to prevent the undermining of domestic standards, and the use of trade policy to export our standards to other countries. The first is legitimate, the second much less so. Even if we care about human rights, labor standards, and environmental safeguards in other countries, we should pursue these goals in other international forums, dedicated to these goals, and not through trade deals. If Vietnam has a labor problem, let us not delude ourselves that we can fix it through the TPP. And if that problem threatens to undercut our labor standards, let’s deal with that as an instance of social dumping, through domestic trade remedies. It should go without saying that fair trade of this sort isn’t anti-trade — quite the opposite. Globally, the principle of fairness should include leeway for poorer countries to grow their economies. That means not saddling them with the restrictive rules on intellectual property, industrial policies, capital-account regulations, and investor rights as current regional trade agreements typically do. I recognize that such considerations leave me at odds with all the established strands of thinking on trade. Populists such as President Donald Trump have correctly identified the malaise with trade and have capitalized on it. But they greatly exaggerate the real-world significance of the “fairness” concern and seem determined to fix a surgical problem with a sledgehammer. Meanwhile, economists rightly point out that trade is only weakly implicated in the major economic problems of the day — deindustrialization and income inequality. They are correct that the distributional consequences of trade are better addressed with safety net programs and nontrade remedies. But they have systematically downplayed these consequences — especially when the requisite compensatory programs have remained on paper. And they seem unable to grasp the valid core of the public’s concern about social dumping. Finally, progressive voices and their allies affiliated with the labor movement in the United States have been keenly aware of the potential for social dumping. But they want to fight it with revamped global governance measures that are at best ineffective and at worst the cause of populist backlash in the countries subjected to them. Responding to the economic and political crises of our day requires that we restore a healthy balance between an open global economy and the prerogatives of the nation state. That requires us to be honest about trade’s consequences — not just the economic opportunities they create for our businesses and consumers, but the stresses they generate for our social compacts. Dani Rodrik is professor of international political economy at the John F. Kennedy School of Government at Harvard University. PRINCETON – As we entered the new year, all indications pointed to a remaking of the global order. Donald Trump was inaugurated as President of the United States, Chinese President Xi Jinping delivered a defense of globalization at Davos, and far-right leaders such as Marine Le Pen and Geert Wilders held an “alternative European summit” in the German city of Koblenz. Trump and his populist allies in Europe have denounced globalization, while Xi now stands as its principal defender. But Trump’s message, in particular, is conflicted: pursuing strictly national economic interests may require less international cooperation, but bolstering security requires more. The nationalist thrust of Trump’s inaugural address echoed the isolationism championed by the racist aviator Charles Lindbergh, who, as a spokesman for the America First Committee, lobbied to keep the US out of World War II. And now Trump, blaming previous US leaders for the economic hardships confronting many Americans, has renounced the country’s historical role in creating and sustaining the post-war order. While his objection to “global America” is not new, hearing it from a US president certainly is. Trump’s vision is centered on the politics of debt. Having overseen a large debt-financed real-estate business, his intuition is that debt renegotiation can be used to win back for America what “other countries” have supposedly taken from it. He has focused on China and Germany, because they maintain large bilateral trade surpluses with the US – totaling $366 billion and $74 billion, respectively, in 2015. Just before the inauguration, he suggested that he might impose high tariffs on imported German cars, singling out BMW with particular relish. With their accumulated current-account surpluses, both countries have built up large claims on the US, in the form of government debt for China and a wide variety of securitized assets for Germany. While China’s foreign reserves are now rapidly falling, Germany’s are rising. But, in both cases, immediately eliminating America’s bilateral deficits would simply make Americans poorer. It would be no different than if Greece suddenly eliminated its large deficits with the rest of Europe. In the past, US policymakers have tried to spur domestic job creation by getting the surplus countries to run budget deficits or loosen their monetary policy, so that they could grow faster and buy more American goods. Former US Presidents Jimmy Carter and Ronald Reagan took this tack in the late 1970s and 1980s, and President Barack Obama did so again in the middle of the euro crisis that began in 2009. This is the classic form of adjustment in the international economic system, and past US administrations pursued this method by applying bilateral pressure, and by working through international institutions such as the G7 and the International Monetary Fund. But these negotiations have always had rather mixed outcomes. Inevitably, neither side is satisfied, and the process comes to be seen as flawed. Trump thinks that this old process failed because the surplus countries cheated. According to this view, China deliberately held down its exchange rate in the years prior to 2015, subsidized Chinese businesses, and restricted foreign ownership rights; and Germany manipulated its currency as well, first within Europe’s hard exchange-rate system after 1979, and then within the eurozone after 1999. The European Union and the eurozone, Trump has concluded, are simply mechanisms to protect German interests and extend German power. There are two alternatives to the classical adjustment approach. The first, more plausible option is to strike bilateral deals. There are some historical precedents for this, such as when Japan, in the 1980s, “voluntarily” agreed to limit the number of cars it sold in the US. Consequently, Japan stopped selling cheap cars and quickly moved up the value chain. Then there is a more radical alternative. Trump may pursue a nationalist version of what is typically a leftist demand: a debt jubilee or write-off. And his strategic reasoning might entail letting China’s own high levels of internal debt, and the unresolved debt issues in the eurozone, blow up. The old style of Anglo-American capitalism was built on manufacturing; but the new style rests on debt – particularly home ownership – to maintain consumption and high standards of living. May’s government could play a decisive role in the current international reordering. But while she has indicated that the UK will pursue a “hard Brexit” – a clean separation from the EU – she has also emphasized how important both the EU and NATO are to the European and global security framework. If May can convince Trump that security is more important than a gamble on leveraged debt, she will have undermined a key part of his domestic strategy, while rescuing some of the old spirit of mutual defense. It’s worth remembering that the only other US president to promote the phrase “America first” was Woodrow Wilson, who ended up trying to build an elaborate international system based on shared security and cooperation.